Goodbye cupcakes, cronuts and duffins, cookies are making a welcome come back in Melbourne right now. Whether you like your cookie crispy, crumbly or gooey, we have your needs covered whichever way your cookie crumbles. We don’t need any persuading to wrap our lips around these little beauties. The most popular cookie at Darren Purchese‘s sweet emporium, Burch and Purchese Sweet Studio in South Yarra, is the mint, white chocolate and pistachio persuader ($12.50 for 12). It’s perfumed with a hint of lemon oil to give it a beautiful fragrance and freshness. Iranian pistachios combine with butter to create a cookie base with a wonderful crumbly texture, crowned with a delicate layer of white chocolate and mint. Like everything else at this sweet heaven, the cookies are freshly baked on site. For the very best of Sicilian handcrafted cookies, cakes and tarts, venture straight to West Melbourne to discover a family run sweet haven. The Sicilian inspired pasticceria focuses on freshly baked goodies, made in-house from fresh seasonal produce. Pastry Chef Marianna DiBartolo has created Dolcetti to celebrate her Sicilian heritage and love for baking. Dolcetti’s high quality produce is also delivered fresh to any inner city cafes including Dukes Coffee Roasters and Seven Seeds. Although Paperboy Kitchen is not a cookie specialist in the traditional sense, the hip Vietnamese lunch spot in Little Lonsdale Street knows how to pack a punch in the flavour department. 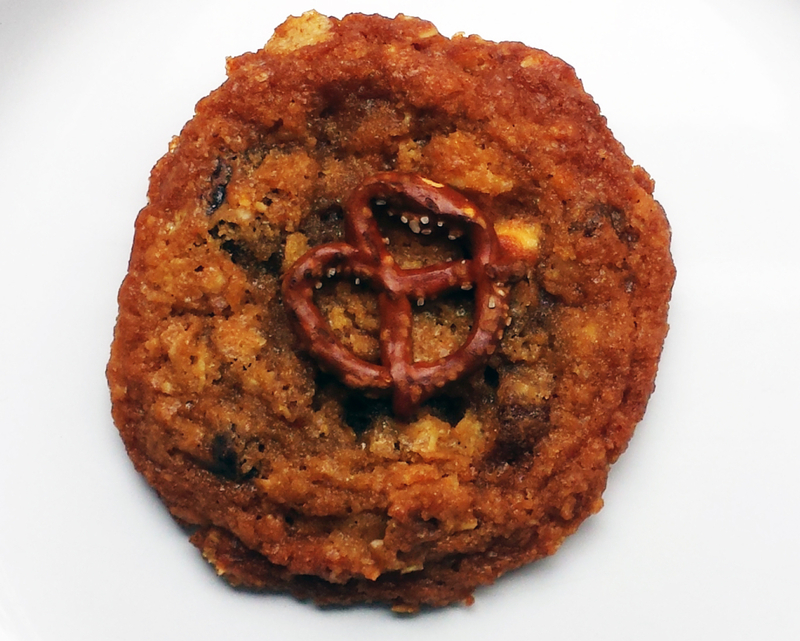 Their one and only cookie on the menu – the milk bar cookie ($3) – is not for the fainthearted. Made from scratch in-house, the cookie is packed full of rolled oats, digestive biscuits and studded with dark and white chocolate chunks. If that’s not enough crushed pretzels and salt and vinegar chips are added for a further burst of palate popping flavour, striking a perfect balance between sweet and salty. The cookie is best enjoyed with their Vietnamese iced coffee, made with single origin filter coffee. 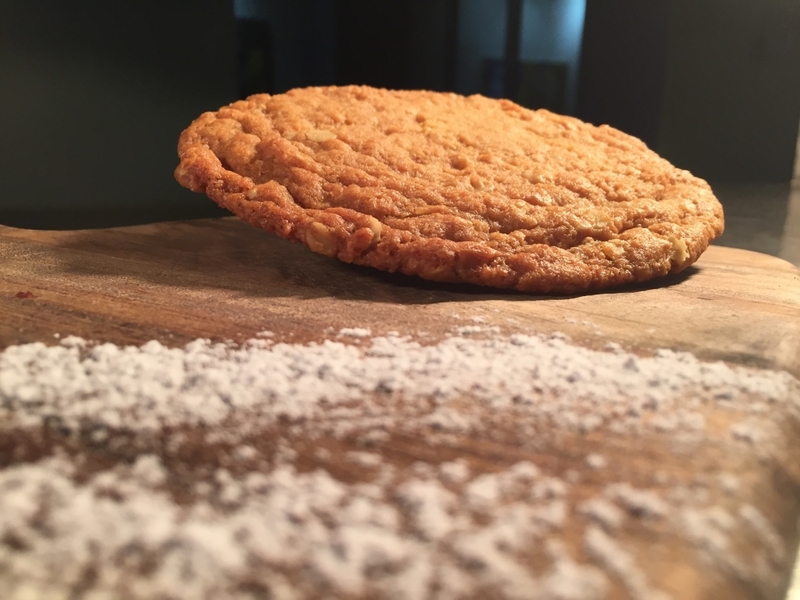 No cookie list is complete without an Australian favourite – the Anzac cookie. Amici Bakery Café in Prahran is famous for its Anzac cookie ($3.50) of epic proportions. The decadent concoction of golden syrup, rolled oats and coconut make it the perfect treat with your freshly brewed coffee. The thin cookie has just the right amount of chew versus crunch factor, making this cookie a stand out amongst its competitors. It is also a low GI alternative to other sweeter cookies at the café, which means you will feel fuller for longer, especially due to its giant size. These nostalgic treats conjure up warm and fuzzy feelings of childhood. 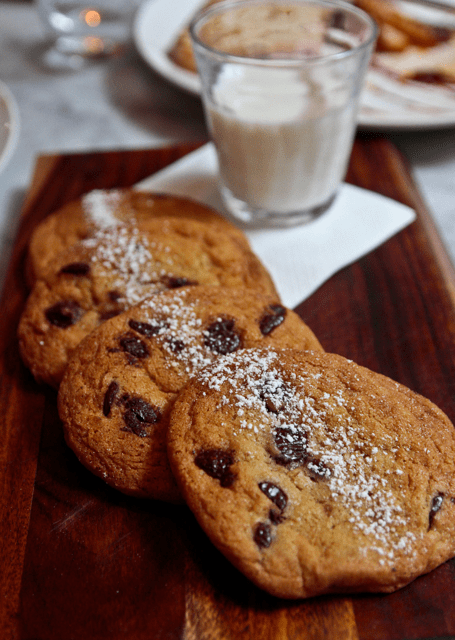 The Grain Store handcrafts the cookies in house, amidst the hustle and bustle of the CBD. Be assured they are not your average chocolate chip cookie. The Grain Store uses only the freshest, seasonal produce including artisan cultured butter, real vanilla beans, free range eggs, unbleached organic flour and chocolate. The cookies are made fresh to order (baked in approximately eight minutes) and are served with a glass of milk ($10 for cookies with or without milk – skinny, quinoa and soy milk are also available). the cookies are best enjoyed dipped in the milk while warm and the chocolate is still gooey. 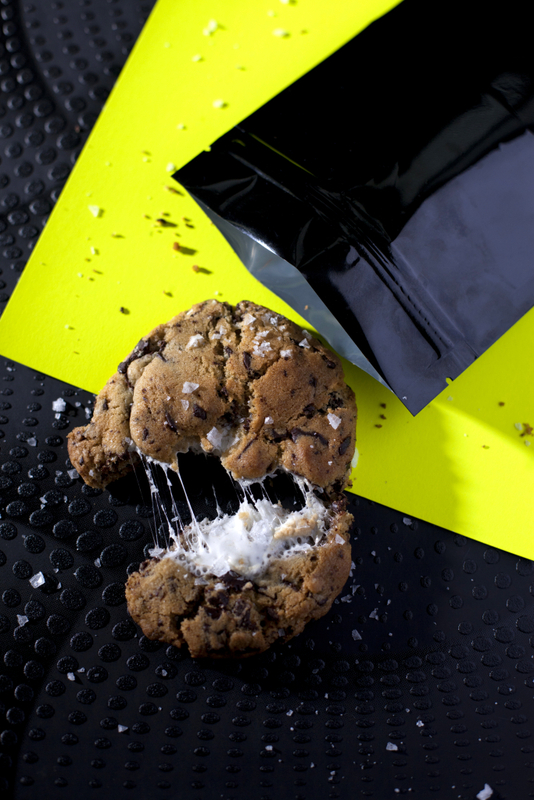 A hint of salt cuts through the sweetness of the cookie beautifully. Earl Canteen is not just famous for its specialist sandwiches. This mouth-watering cookie ($2.50) has developed somewhat of a cult following at Earl Canteen recently. The cookies are crunchy on the outside, soft in the middle and packed with generous chunks of chocolate chips. But the chips aren’t just your average chocolate – they are Callebaut (Belgian) made up of 55% cacao, a beautiful pairing to cut through the tang of the sea salt. 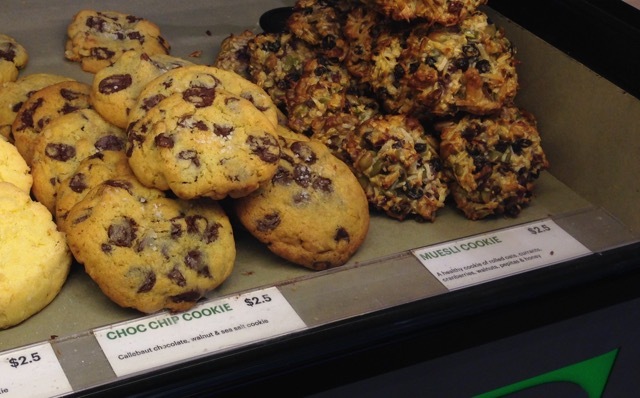 All of their cookies are baked fresh daily at their four stores. Don’t leave home without trying their other two cookies in the range – the coconut and lime zest sugar cookie and the health conscious muesli cookie. There’s a lot to love about this cookie at Matt Forbes’ cosy Yarraville café, Cobb Lane, which is freshly baked on the premises. 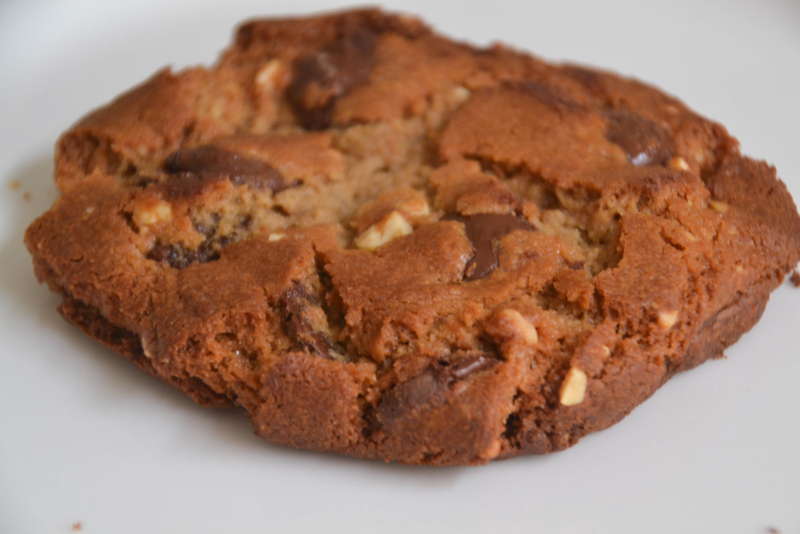 The scrumptious peanut butter and chocolate chip cookie ($4) strikes a great balance of chocolate and nuts with its crumbly, soft texture. Comprised of a plain buttery base infused with peanut butter, the cookie is studded with chunks of melting milk chocolate and roasted peanuts. And the best news? They are gluten free as are many of their baked goodies. There’s a good reason why Dench Bakers has developed a strong following in the Melbourne foodie community. Their hand-made sweets are beautifully crafted with exquisite attention to detail. 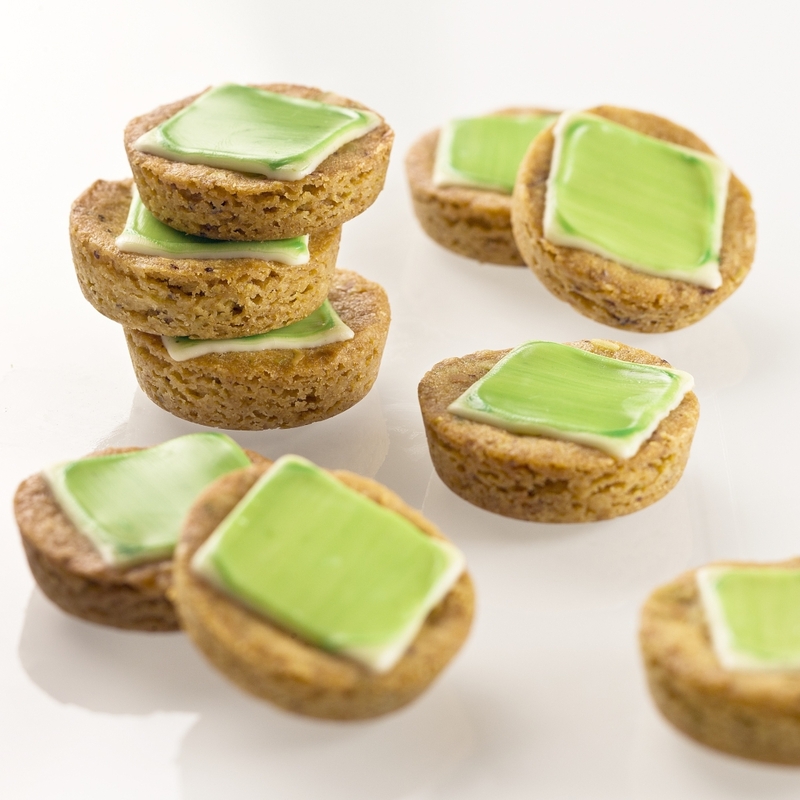 The gluten free pistachio pinolate petits ($2.70 each/$8.50 for a packet of 135g) are a new addition to the baking range and are the perfect treat for any time of day. The crushed pistachios give the cookies a striking colour and a sumptuous nutty, crumbly texture. The only problem is trying to stop at one. Expect the unexpected at Candied Bakery in Spotswood – an Aussie bakery with an American and European twist. One of their biggest sellers is the sugar loaded chocolate and marshmallow cookie ($4.20) which is packed with chewy marshmallow discs, chocolate chunks and a sprinkling of sea salt on top. We recommend you wash it down with one of their famous apple pie shakes ($6.50). Peanut butter fans – don’t miss their peanut butter and jelly cookie, comprised of two thin cookies sandwiched around a filling of jam and cream. Raw food lovers are in for a treat at Ace raw cookies and milk, one of the traders at Like Minded Projects collaborative space on Smith Street. Their peanut butter and jelly cookie (the chewiest of all the cookies at $4) is the bomb, made up of 100% raw ingredients including crushed nuts and a drizzling of raspberry chia jam. Since the biscuits are packed with protein and low in sugar, you can enjoy the cookies almost guilt free. You can also build yourself an ice-cream sandwich using two Ace cookies and a scoop of Zebra Dream ice cream.